You just bought an ebook from the Lulu.com Bookstore, now how do you read it? One word at time of course! But, you must first download the ebook file then decide how and where you want to read it. What types of ebooks can I buy on Lulu.com? EPUB: This is a standardized electronic publication format featuring reflowable text suitable for use on most eReader devices except the Amazon Kindle, which uses the MOBI ebook format (see below for Kindle instructions). EPUB files can also be opened and read on your computer if you have installed eReader software on your computer, such as the free Calibre or Adobe Digital Editions readers. PDF: This is a file that can be downloaded, opened, and viewed on your computer, laptop, or tablet, using the free Adobe Reader. All eReader devices (Kindle, NOOK, iPad, Kobo, etc.) can also open PDF files once the file is added to your eReader’s library. How do I know if an ebook is in PDF or EPUB format? When you are purchasing an ebook in the Lulu.com Bookstore you will see either ebook (ePub) or ebook (PDF) displayed above the book cover. ebook (ePub): You are purchasing an EPUB ebook that can be read from either an eReader or eReader software such as the free Calibre or Adobe Digital Editions readers. ebook (PDF): You are purchasing a PDF ebook that can be read using Adobe Reader. How do I read my ebook on my computer? Once the purchase is complete, you can download your ebook from the Checkout page. If you have a Lulu.com account, you can also download your ebook by clicking on your username and selecting My Orders. To open a PDF file on your computer, laptop, or tablet, simply double click on the BookTitle.pdf file and it will open in Adobe Reader. To open an EPUB file on your computer, right click on the book title, choose Open with, and select your preferred ebook reader application. If you have not installed an ebook reader on your computer, laptop, or tablet, there are several free eReaders that can be downloaded from the Internet, such as the Calibre or Adobe Digital Editions readers. When you purchase an ebook in EPUB format and download it to your computer, laptop, or tablet, you will notice the file name ends with EPUB (BookTitle.epub). If you plan to read this ebook on your computer, laptop, or tablet you must download and install an eReader application. There are several free eReaders that can be downloaded from the Internet, such as the free Calibre or Adobe Digital Editions readers. IMPORTANT NOTE: The Adobe Reader is intended for reading PDF files. Attempting to open an EPUB file in Adobe Reader will result in a “corrupted file” error message. Once an eReader application is installed, simply right-click on the ebook’s file name, choose Open with, and select your ebook reading software. 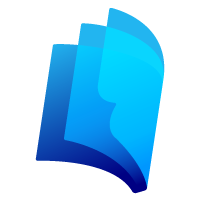 The book will be added to the application’s ebook library where you can simply click on the title and start reading. Helpful Hint: Once you add your first ebook to the eReader application, you can choose to always open these types of files (.epub) using this software. If you choose this option, your ebooks will automatically be added to your reader library when you purchase, download, and open a new ebook. As an added bonus, you can also open PDF files using these ebook readers, which means you can keep all your ebooks (PDF and EPUB) in one library. I can’t remember if my ebook was in PDF or EPUB format. What do I do? If you are unable to locate a previously downloaded file, that’s not a problem. Log into your Lulu.com account, click on your username and select My Orders. Your purchases, including ebooks, are listed on your order history page. Simply find the title, and click View Order Details. As in the Bookstore, your ebook’s file type is displayed along with the book cover, title, and author name. Note: ebook purchases made prior to March 17, 2012 can be accessed by clicking the link at the top of the page. I purchased an ebook a long time ago and now I cannot open it. Prior to January 15, 2013, a Lulu author may have chosen to apply Digital Rights Management (DRM) protection to their PDF or EPUB file. If so, the file must be initially accessed using a registered copy of Adobe Digital Editions (ADE), a free downloadable application that is different from the widely used Adobe Reader. For more information about accessing DRM Protected PDF and EPUB files, see Download ebooks with DRM Protection. For more information about adding ebooks (EPUB and PDF) to your eReader, see Download ebooks from the Lulu Marketplace to an iPad or Nook.